This is an exciting day for me. 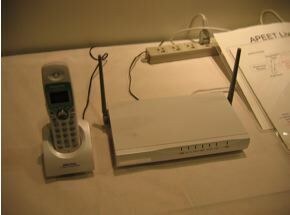 We are giving out Hitachi WiFi SIP Phones at APRICOT 2005. 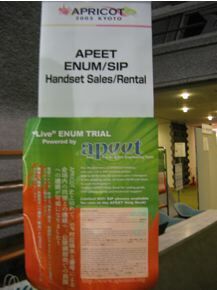 This is part of the APEET ENUM/SIP Live Trial we have been putting together for the last few months. Every wifi phones are assigned with a SIP address which also comes with an ENUM1 number and this allows APRICOT delegates to call each another. Additionally, we also put up PSTN gateways in China, Taiwan and Singapore (US pending) so these phones can also be used to call back to PSTN phones in these countries (free of cos). We also pre-registered every APRICOT delegates with a SIP account and ENUM numbers which they can used with their softphones with instructions on how to set it up. There is also an ENUM registration system where they could use it to configure the ENUM to associate it with their webpage, emails etc etc. ENUM client is also provided, of cos. There is also a booth setup where we explained to people how we setup the system and we have some SIP phones on display. Particularly of interest is this phone from Panasonic which comes with ENUM resolution built-in! 1 Technically, it isn’t ENUM because we are not using e164.arpa. 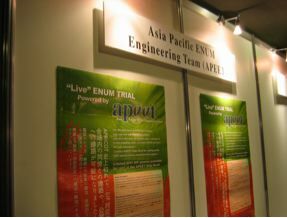 The numbers we gave out is assigned from apenum.org, ie. 8.8.8.apenum.org. 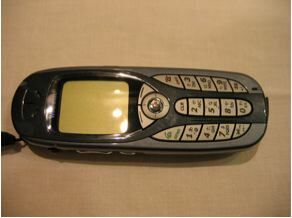 This entry was posted on Monday, February 21st, 2005 at 7:33 am and is filed under APEET, Toys and Gadgets, VoIP. You can follow any responses to this entry through the RSS 2.0 feed. Responses are currently closed, but you can trackback from your own site.